To many, if not most anglers, the anticipation, though not always the realisation, of catching large numbers of big fish is basic to their enjoyment of the sport. For the sea angler the possibility of catching large fish, perhaps even larger than any previously landed, is ever-present. This element of the unknown is psychologically important to us all. Just as we live for about seventy years so the maximum age of each fish species is, within fairly wide limits, defined. 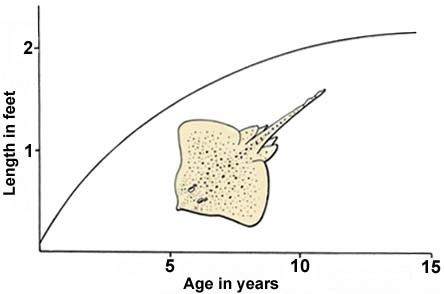 For example most pouting have a chance of living for about three or four years (if they are not eaten first) whereas the common skate may survive for up to fifty years. In colder seas a species will tend to grow more slowly, live longer and mature later than in the warmer part of its range. Unlike man, a fish will tend to increase in length and weight more or less throughout its life span. 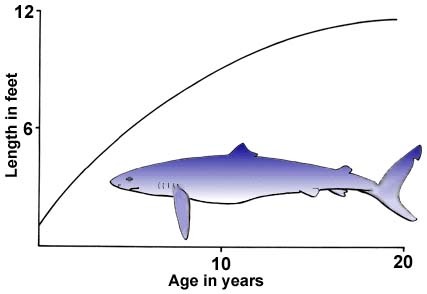 Because of this there is always the chance of catching a fish which, due to its faster growth and/or greater age, is larger than any previously caught. In this article the size, growth and age of a number of fish not considered elsewhere are described as a way of introducing the methods used by scientists for determining these characteristics. The simplest and most direct method used to assess the growth of fish is to keep them in tanks and to take them out at intervals to be weighed or measured. In his book “The Sea Anglers Fishes”, Kennedy mentions observations of this type on conger eels in large aquaria. These fish grew very quickly and the largest increased from 3-pounds to 90-pounds in only five-and-a-half years. Unfortunately, this sort of growth measurement may give misleading results because of the artificial conditions of such things as temperature, exercise and food supply. Similarly direct and in some ways more satisfactory, is the method in which fish are caught, measured, weighed and tagged before being returned to the sea, the idea being that the fish should be recaptured and re-measured on some future date. Unfortunately, fish may die or be otherwise affected by the tagging procedure and the chances of catching a given fish for a second time are quite small. Despite all the drawbacks, tagging and recapture methods have been used successfully, particularly in the case of skates and rays. These fish have no bony scales from which the age can be determined. 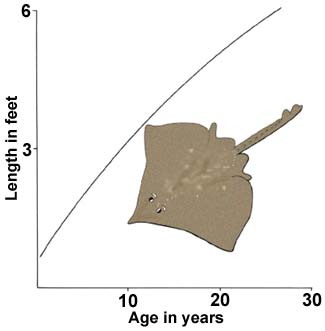 Tagging has shown that males and females of the tiny spotted ray grow at the same rate, both taking fifteen years to attain a length of 2-feet. These rays are often taken in our area when legering with ragworm and small fish-baits. The blonde ray, with which the spotted ray is often confused, is a larger fish altogether and grows much more quickly. The female blonde is slightly smaller than the male but both reach lengths of well over 3-feet in ten years. The well-known thornback grows to roughly the same size as the blonde, but in this species the females are substantially larger than the males. 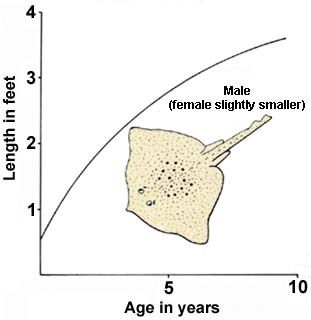 Growth is a little slower than in the blonde and 3-foot long males are about fifteen years old. 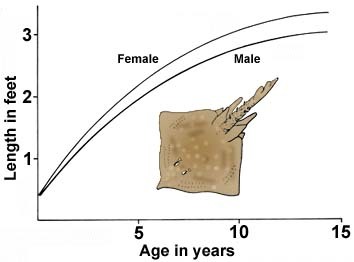 A less direct method of ageing has been used on the large common skate, that great `barn door’ of a fish beloved of deep sea anglers. The vertebral column or back `bone’ of this fish is actually made up of cylinders of cartilage joined end to end. By cutting across one of these cylinders a series of rings is revealed. These rings are similar to those seen on tree trunks and each represents a single year in the fish’s life. By counting the rings it has been possible to show that the common skate takes about twenty years to reach over six feet in length. These fish do not mature and breed until they are about eleven years of age. As already mentioned, skate of up to fifty years old have been recorded. The blue shark is an active predatory fish which feeds on herring, mackerel, pilchard, squid, spur-dogfish and even conger. This cartilaginous fish has also been aged by means of the rings in the vertebrae, but to accentuate these annual rings it was necessary to stain them with silver nitrate. Blue sharks grow very quickly so that a ten-year-old fish will be 9- or 10-feet in length. A 12-foot shark may be as much as twenty years old and the diameter of its vertebral column will be about 1.5 -inches. 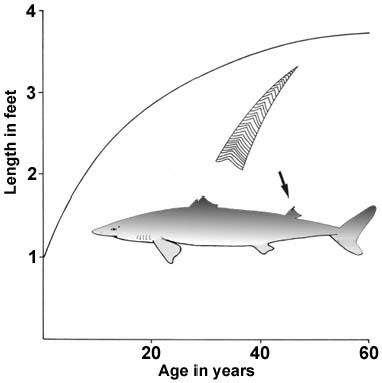 A much smaller shark, the spurdog or spiny dogfish, has been aged in a similar manner but in this case it was by counting the growth lines in slices of the second fin spine. Male and female spurdogs grow at about the same rate but the latter lives longer. It is surprising that a large female spurdog of about 4-feet in length can be almost sixty years old. This great age has also been confirmed by a second, very expensive and extremely laborious method, which involves the use of X-rays to detect rings in the vertebrae. The bands thus detected are due to annual deposits of calcium and phosphorus. Using this method it takes about six hours to age a fish of thirty years. The structures of bony fishes also show annual cycles of deposition, the scaly armour of most being marked with rings which show a yearly pattern. The pattern on the scale may be due either to alternating periods of fast and slow growth in summer and in winter or to brief checks in growth caused by spawning. In some species the age recorded on the scales is so poor or incomplete that they are of no practical value. In these difficult cases, other structures such as the opercular bone, one of the main bony plates on the gill cover, may provide a superior record of growth and age, also in the form of concentric rings. Some of the internal structures of bony fish also show an annual cycle of rings or lines. A good example is the otoliths or ear bones, three of which are present within each side of the head. These structures are removed and used for ageing, but the advantage of using scales is, of course, that the fish may be returned alive and the scales will then regenerate. The scales of the thick-lipped grey mullet provide an excellent record of age and growth. Differences in the width of the zones between the scale rings show that these fish grow more slowly in cool summers than in warm ones. Examples of the use of these methods are to be seen in some of the fish dealt with elsewhere. After being cleaned in boiling water the opercular bones of the bass exhibit a superb set of annual rings. As in the mullet, the width of the rings is greater in warm than in cold years. Being a fish of warmer waters the bass also shows other responses to years when the weather is good. Strong year classes such as those born in 1949 and 1959 originated in years when the sea was warm and there was a preponderance of light southerly winds in the period from May to September. On average, bass that were born in the 1970s, were smaller at the same age than were those born in the 1950s. The turbot is a flat fish that has no scales and is protected by a tough leathery skin and a few bony lumps on the eyed side. To age turbot the ear bones (otoliths) must be removed and the rings on them counted. In the case of massive, thick ear bones from these or any other fish, it is sometimes useful to grind them down on a slip of carborundum or to snap them across and `accentuate’ the rings by charring them in a flame. The sole and other flatfish are also often aged by this technique.